This year is the 50th anniversary of Star Trek, and even after five decades there has never been another series like Gene Roddenberry’s brainchild. We’ve had plenty of spaceship shows since 1966, but some things about Trek remained unique. Here are 10 Star Trek achievements that nobody else managed to pull off. Even the later Star Trek series didn’t really do this, although you have the occasional story by someone like Peter S. Beagle. But it’s still pretty mind-blowing that the writers of the original Star Trek included Theodore Sturgeon, Harlan Ellison, Jerome Bixby, Norman Spinrad, Robert Bloch, Richard Matheson, and others. 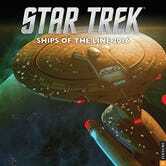 And a few other famous science fiction authors nearly wrote for Trek as well. Among successful TV shows, only The Twilight Zone even comes close to that record. Also notable: Trek was always open to new writers, including over-the-transom submissions for several years, and a lot of television’s best scribes got their start at Star Trek University. For its time, the original Trek was pretty revolutionary—the inclusion of Lt. Uhura among the core Bridge crew was such a big deal, Martin Luther King urged Nichelle Nichols to stay on the show. Kirk’s crew also includes an Asian man and (at the height of the Cold War) a Russian. And later Trek series continued to push the envelope: TNG’s crew includes a disabled engineer, for example. And Deep Space Nine and Voyager’s inclusion of, respectively, an African American man and a woman as captains felt extremely cutting-edge in the early 1990s. This sort of goes along with the Prime Directive and things like it, but it deserves its own item because it’s such an important thing. Gene Roddenberry’s insistence that people of the 23rd century would have evolved past the greed, fanaticism, paranoia and prejudices of the 20th century is often criticized as an impediment to good storytelling. And sure, when you see this taken to its extreme in the first two seasons of The Next Generation, it’s often hard to watch. But as much as Roddenberry’s utopian sensibility got in the way of traditional storytelling, it also forced these shows to come up with new—and often fascinating—ways to generate conflicts. Just having a starting point that these characters have an open mind and want to understand the cultures they encounter feels revolutionary, and is still an aberration in media science fiction. Plenty of science fiction indulges in allegories for racism or war or other social issues. Trek is still notable for how far it pushed allegories and thought experiments, week after week. This was not always a good thing: classic Star Trek’s attempts to tackle racism and the Vietnam War were sometimes so clumsy as to be almost unbearable. But at the same time, Star Trek’s tendency to delve into thought experiments is sometimes uncomfortable in the best way, and at its best, all of the Trek series would delve into situations where there’s no easy answer, and the parallels to our present-day reality were inescapable. Everybody’s doing shared universes nowadays, and to a large extent this is an attempt to imitate what Marvel and DC accomplished in their comics, decades ago. But on television and in the movies, Star Trek was one of the first series to create a universe in which different ships, and different crews, felt like they all belonged to the same basic setting without being just “spin-offs.” Add in the book-only series like New Frontier, Corps of Engineers, Vanguard, Seekers and so on, and you’ve got a capacious galaxy. Star Wars always comes back to being about the Skywalkers and their friends, in the main media series, but Star Trek is just about Starfleet, and any Starfleet officer could star in a Star Trek show or movie. Gene Roddenberry and other Trek creators had served in the military, and some of the best Star Trek: TOS episodes are explicitly a commentary on how war turns good people into monsters. I didn’t realize for years that the very first Klingon episode is the one in which the godlike Organians force Kirk to make peace with his enemies, and Kirk is snarling at being denied his right to attack. And the best TOS episode, “The Balance of Terror,” is a remake of the war movie The Enemy Below, in which we spend a surprising amount of time getting to know the Romulan commander and sympathizing with his decisions. TNG dealt with issues like torture and war crimes with more sensitivity than television generally musters, and Deep Space Nine created a study of the costs of war that remains unparalleled. Another thing that’s great about the fact that Star Trek has been around for so long is that we got to see Kirk, Spock and even some of the TNG characters get older and change as people. In retrospect, some of the most memorable moments in Star Trek’s history—especially Wrath of Khan and the TNG finale “All Good Things”—are about characters that we’ve gotten to know grappling with getting older and not being the same people they used to be. Until recently, Star Trek never gave in to the temptation to recast its major characters or try to keep them eternally young. The “big dumb object in space” genre is a mainstay of science fiction books, and we occasionally get an eyefull of it in movies like 2001. But Star Trek was relentless in its insistence on pitting its heroes against huge phenomena that they couldn’t fully understand—there are huge space amoebas, giant planet-killers, massive holes in spacetime, and much more. We tend to mock the later Star Trek shows for their endless plots about spacetime anomalies and other technobabble items, but the fact that so many of the stories throughout Trek’s history have been driven by “there’s something huge and strange, and we don’t know what it is” is kind of amazing when you think about it. And here’s where I have to give props to J.J. Abrams’ first Trek movie for using real-life images of Saturn from the Cassini Space Probe for its most arrestingly beautiful images. Top image: Star Trek: Ships of the Line calendar 2016 (and Star Trek: Vanguard: Storming Heaven by David Mack). 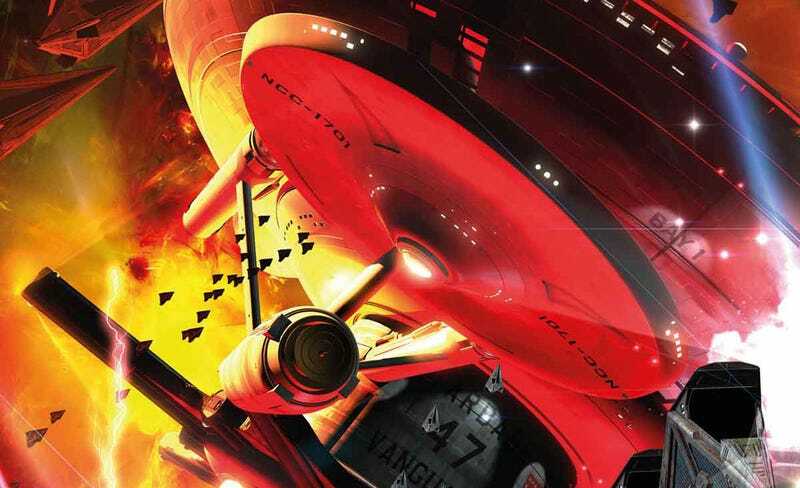 Enterprise/Saturn image from Star Trek 2009 via Roddenberry Productions (Lenticular Print).